Every summer, my mom would take us kids school shopping at a local department store. With each shirt, sweater, and pair of jeans my mom would call us out of the dressing room to see how things fit. “Bend your legs. Make sure they’re not too tight. Lift your arms… higher, now! Stretch. Make sure there’s plenty of room to grow!” My brother and I would roll our eyes and groan. Now of course, I realize my mom was wise. Kids do need room to grow. Not only do they outgrow clothes in the blink of an eye, they also grow as readers and writers. This is why we need classroom libraries stocked with a wide range of levels, and it’s why we need writing centers stocked with paper choices. As you set up your classroom for the coming school year, you may want to consider what “sizes” of paper your students might need. You’ll want to nudge kids toward selecting paper that leaves them a little room to grow. Rather than paper they easily fill on the first draft, encourage them to choose paper that is just one “size up” from their usual first draft. That way, there will be a few empty lines, leaving room to revise by adding more. * You can find all these paper choices and others here. 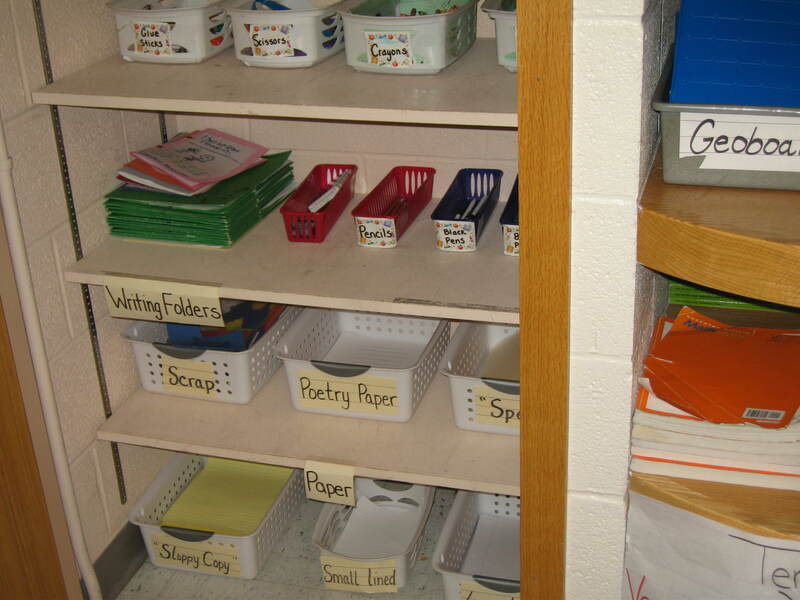 To organize all these paper choices, you will probably want to set up an organized “Writing Center” in your classroom that is easily accessible, and is designed for kids to access the materials on their own. This might be a low book shelf, a desk converted into a center, or a set of drawers or cubbies that can store paper choices and other necessities for writing workshop. When organizing the paper at your Writing Center, you might consider labeling trays, baskets, or drawers of paper with clear picture clues, making it easy for kids to find the paper they need (and to put back extra paper). Trays, baskets or drawers will keep the paper supply organized and easy to manage. Clearly labeled baskets make this writing center (housed in what was once a closet, now with door removed) nice and neat. From the first day of school, no matter the age group, you will probably want to teach kids how to get paper from the writing center whenever they need more. Who wants to be passing out paper, when you need to be conferring and pulling small groups? In your observations and conferring with students, if you notice a kid who is having trouble with choosing the appropriate paper (or is taking too much paper, or is “wasting”) then you can teach into that during a conference. 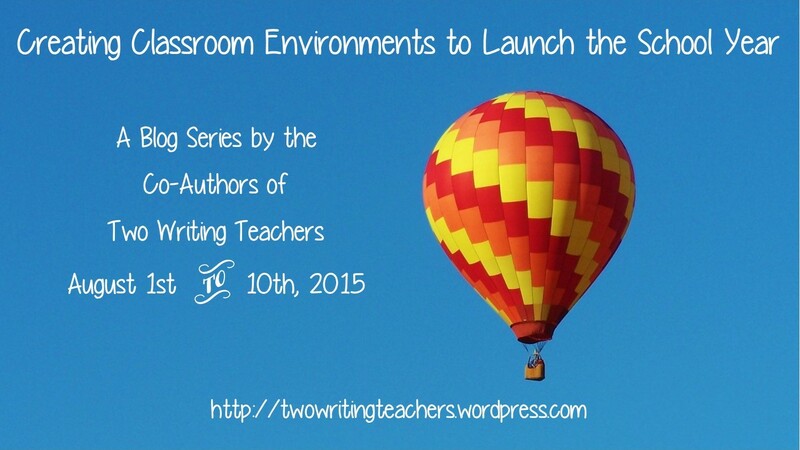 For more on this, join us for our Twitter Chat, where we’ll be discussing many ways to create classroom environments to launch the school year! Let’s chat on Monday, August 10th at 8:30 p.m. EDT, when the eight of us host a Twitter Chat about classroom environments. Just search and tag #TWTBlog to participate. Your post reminds me that sometimes the most obvious classroom strategies are usually the ones overlooked. Thank you for bringing my focus back to the kids and what they need. I may have to tweek the paper layout, since I will be expected to teach my middle school kids to write with the Cornell notes method. The idea of students using just right paper is SO important! I love it when kids design their own paper to make it work for them as well. Thank you for this post! I agree Connie! Having kids design their own paper is engaging AND gives kids more responsibility over their work! I love this post! Reminding us to think of our growing writers and the need to teach routines and procedures in our workshops is so helpful as we are beginning to think about our classrooms. I so appreciate all the resources you have shared—WOW!! I offer lined and unlined paper in our workshop, but I find myself waffling on booklets or free sheets daily. This seems to be a constant debate in my mind. Oh! I love blank paper too! Why didn’t I think of including that! Thank you for the reminder! I love the graphic you created about paper choice. You summed it up so succinctly. I have always been a blank paper kind of gal. I want to give kids the opportunity to create pages for their books like Marla Frazee or Lois Ehlert where they can stretch out the moments they need and play with text across the page. However, I am starting to see that perhaps some children need a bit more scaffolding to increase their writing output. I am starting to see how lines could be useful in that area. Thanks for sharing all you did in this post. 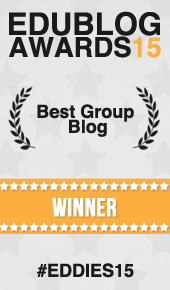 I spent some time exploring your own blog and the resources there. Wow! Blank paper certainly has its advantages–as do the lines. That’s why choice is so important, and conferring with individuals can steer kids in a direction that makes sense. I love the way you crafted this post, Beth! The opening part about trying on clothes and leaving room to grow was the perfect segue into writers needing room to grow with their paper choices. The piktochart of paper choices is a very helpful reference. I love that writing center picture with everything so clearly and neatly labeled. I also found your specific examples of minilessons to be clear and helpful. Beautiful post! It is wonderful to have you all back. I love the reminder of paper choice. Choice matters, but you also reminded us that we must teach our writers how to make choices that will support their work. Purposeful. Looking forward to the rest of the week and the chat on Monday. Happy Writing!